OTTAWA -– Focus Graphite Inc. (TSX:V; OTCQX: FCSMF; FSE: FKC) is pleased to announce the introduction of a Superfine Grade of coated spherical graphite product sourced from its Lac Knife Graphite Project at Fermont, Quebec. The Company’s manufacturing accomplishment was achieved under the direction of Dr. Joseph Doninger, Focus’ Director of Manufacturing and Technology, and follows the Company’s original May 27, 2014 announcement of the development of its premium standard (medium) and fine battery grades, and; its subsequent August 8, 2016 announcement of the successful purification of Lac Knife’s fine grade material to 99.99% purity which is shown in the following Scanning Electron Microscope (SEM) photomicrograph of a flake of purified Lac Knife graphite. Focus Graphite’s new Superfine Grade graphite product development was first presented to the 34th International Battery Symposium (IBS) in Fort Lauderdale, Florida, by Dr. Doninger on March 21, 2017. Focus Graphite’s development and introduction of a Superfine Grade to the battery market represents a milestone in the Company’s ongoing efforts to continuously improve its products to meet industry demands and are intended for use in various lithium-ion battery applications. 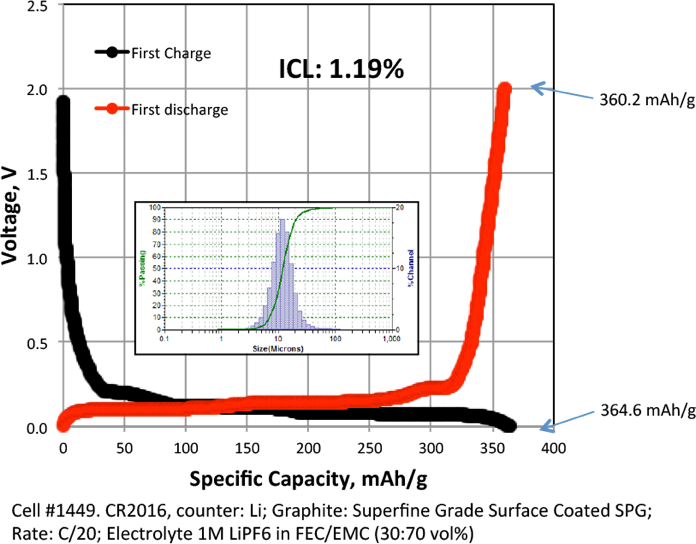 The 1st cycle Galvanostatic curves in Figure 1 show that the new Superfine grade of spherical graphite has a very high reversible capacity of 360 mAh/g and low first cycle loss of only 1.19%. Dr. Doninger said the main benefit of the Superfine Grade is based upon the physical reality of the graphite’s performance within the anode of a lithium ion battery. “As the particle size decreases, the time it takes for the lithium-ion to transfer into the graphite structure during charging and out during discharging, thereby improving charging rates,” he said. 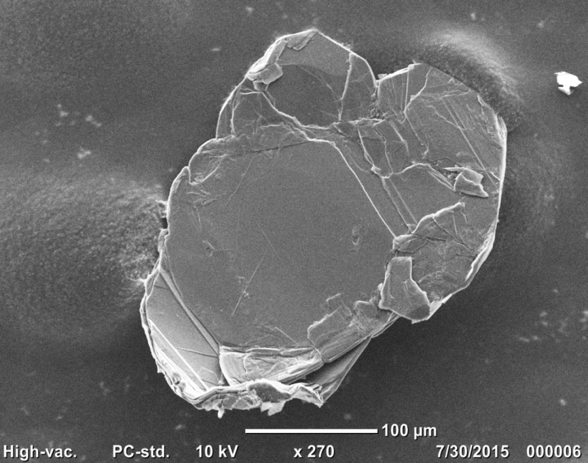 An SEM photomicrograph of the Superfine Grade of the Lac Knife spherical graphite is shown below. 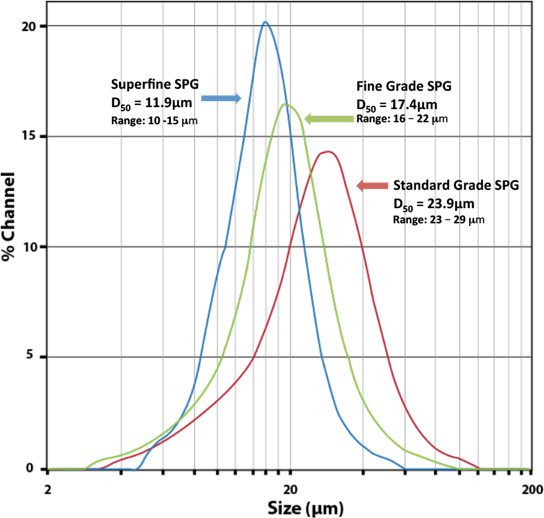 The particle size distribution curves for the new Superfine Grade of spherical graphite are compared with the Standard and Fine Grade curves in Fig. 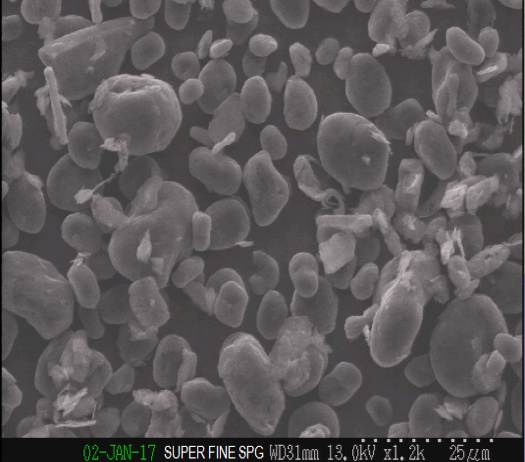 2 and show that Focus now offers a wide range of particle sizes to meet the demands of the battery industry. Dr. Doninger noted that the high Reversible Capacity of 360 mAh/g, low Irreversible Capacity Loss of 1.19% and low surface area of 0.89 m2/g for the new Superfine Grade of spherical graphite compare very favorably with the Lac Knife’s Standard and Fine grades introduced in 2014 as shown in Table 1. The Company knows of no other junior graphite developer today with a deposit capable of competitively converting their fine flake component to battery grade production. Focus Graphite President and Chief Executive Officer Gary Economo said the Company’s ongoing R&D and materials testing aims to position Focus as a commercially competitive and important source of new graphite products for next generation energy storage and production. “The key to growth of our value-added products stems from our technology vision of investing in those in-house process developments that meet future demands of the battery manufacturing industry,” Mr. Economo said. “In this regard, and as evidenced by the periodic publications of data in support of our progress, Focus remains committed to achieving its long-held goal of unlocking shareholder value from that technology vision,” Mr. Economo said. As a technology graphite developer, Focus is deeply engaged in R&D and development of graphite concentrate and value added products for a low carbon economy. Focus’ low temperature process versus conventional very high temperature purification processes obviates the use of large amounts of energy – one of the largest single cost components of graphite purification. Focus Graphite has acquired an intimate understanding of both the future needs of the battery manufacturing sector and trends in that sector as a long-standing Board Member of Chicago-based NAATBatt International (the National Alliance for Advanced Transportation Batteries). Holding the ability to purify Lac Knife’s fine flakes expands the company’s potential to sell substantially more of the graphite extracted from Lac Knife into high-value, high-tech applications instead of approximately 30 percent being sold for lower value industrial applications.